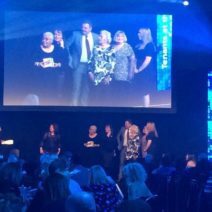 Wythenshawe Community Housing Group (WCHG) was delighted to win not once, but twice at the 2017 Tenant Participation Advisory Service (TPAS) awards. The Group won in the Excellence in the Tenant Engagement & Excellence in Tenant Scrutiny categories at the northern regional TPAS awards which took place at the The Hilton Manchester, Deansgate on the 7th of April. The winners from each category will now go forward into a national final being held on the 13th July at Chesford Grange in Warwickshire. TPAS is the marker leader in the UK for Resident Involvement and they work tirelessly in empowering individuals to have real influence over the organisations to which they pay their rent.